Since I’m not currently training for a race, I’ve been focusing on my strength work and specifically my core. I’m doing two core specific workouts a week plus some core work is part of my strength training works. 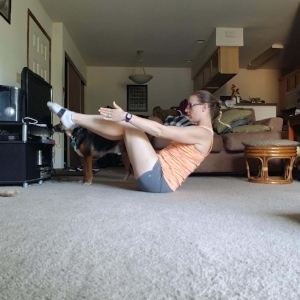 So today I am sharing my favorite core exercises that I love when they come up in my workouts! Lie face down in a push-up position. Keep your palms on the floor next to your shoulders and your feet flexed with the bottoms of your toes on the floor. Take a deep breath and press up into a pushup. Your body should make a straight line from your heels to the top of your head. Begin in a seated position with your knees bent and your feet flat on the floor. Lift your feet off the floor. Keep your knees bent at first. Bring your shins parallel to the floor.